When your baby keeps you up all night long and you can’t get more than two or three hours of shut-eye at a time, it can feel like your whole world is falling apart. You’re exhausted. You can’t think straight. Your nerves are completely frayed. You wonder when this exhaustion will end, but each night it just continues. Did you know that sleep troubles typically don’t go away on their own? That’s right, in order to fix all the wakings, you may have to do a little bit of work. Here are some of my best tips to help you get started. This is the easy part. Start with a solid, and consistent bedtime routine at a decent hour (no later than 8:30pm). This will help teach your baby predictability. The more your baby knows what’s coming, the more likely he or she will accept it. You can start with something simple like washing up, pj’s, and reading a book or two. It doesn’t have to be anything complex. As long as it is the same routine, every night, at the same time. Eventually, your baby will get use to this routine and will know it’s time to go to bed since the routine will help signal that. This may include things such as: room darkening shades, swaddling if your baby is young, comfortable jammies, proper room temperature. Anything you can do to make your baby as comfortable as can be to promote a restful night’s sleep. Babies are picky about comfort. Don’t compromise safety, but make sure your baby’s sleep environment is just right for him or her. Take my advice, unless you want to be up all night replacing that pacifier, comfort nursing, or rocking your baby back to sleep, allow your baby to self-settle and fall asleep on his or her own. It’s the best thing you can do for your baby’s sleep. And imagine how many extra Zzzz’s you can catch, if you don’t have to keep running back in the room to put your baby back to sleep. I’m not saying you should never rock or nurse your baby to sleep, but if you are up all hours of the night doing so, this is not healthy. Not for you, not for your baby. Lay your baby down awake and let him or her fall asleep completely their own. So here’s the thing with hunger, babies can usually sleep through the night when they are developmentally ready to take in enough calories during the day, so that they don’t need to wake at night to eat. If your baby’s stomach is not yet mature enough to do this, you can fill her up all you want, and she still won’t sleep through the night. A newborn’s stomach is small and needs to grow enough to be able to hold a substantial amount to make it through the night. With that being said, you want to make sure you are always giving your baby enough breast milk or formula, so when that developmental milestone is reached, your baby will be able to sleep through the night, and not wake hungry a few hours later. Experts say this happens anywhere between 3-6 months of age. If you have been putting off making any changes in your baby’s sleep routine for fear of what you might have to deal with, then remember that it’s most likely only going get harder as your baby gets older. Also, keep in mind that a tired baby is a cranky baby, so you are not doing your baby any favors by putting things off. When your baby is overtired this makes skills like rolling, crawling, and standing much harder to accomplish. Can you imagine putting a baby that is not well rested down on a mat to do tummy time and practice rolling . . . yeah right! 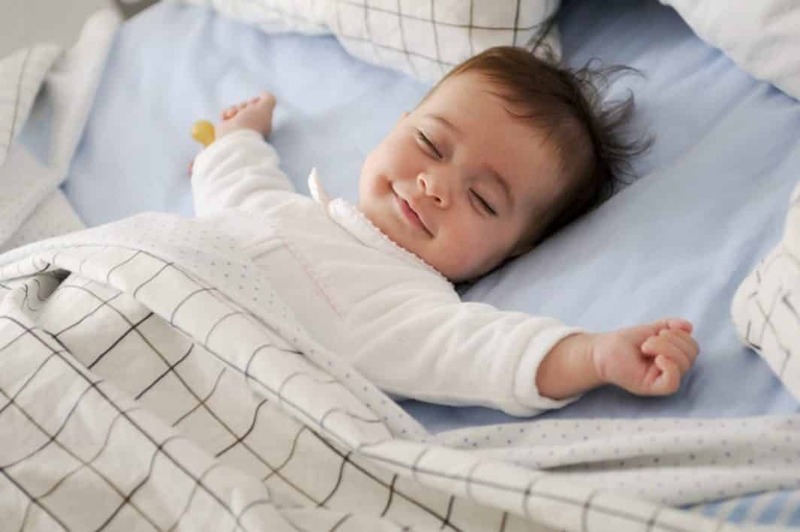 Babies need to get a certain amount of sleeping hours in each day, otherwise reaching developmental milestones is going to be extremely difficult for them. Not to mention what the fragmented sleep does to you as a parent! Your nerves get frayed, you’re on edge, you’re anxious about what the next night is going to be like. Trust me, I know! I have been through months of exhaustion and lack of sleep. When I finally learned how to get my baby to sleep through the night, I was astonished to find out that there are so many things I was doing wrong. I quickly learned how to fix things, and now I have two wonderful sleepers. And I help parents all over the world with this! Good luck and happy sleep! Violet is the Owner and Founder of Sleep, Baby, Sleep®, where she helps parents worldwide who are struggling with getting their babies and toddlers to sleep. She is Pediatric Sleep Consultant, Registered Nurse, Potty Training Expert and Published Author of "Baby Sleep Training in 7 Days".